Flies are a national nuisance in Australia. There are about 30,000 different species in Australia. Flies contaminate food, dirty surfaces and spread disease to humans and animals. Flies feed by vomiting on their food source prior to eating. They consume decaying matter, carcasses, garbage and faeces. It’s no wonder they are the number one pest in both domestic and commercial settings. Physical exclusion – This includes common sense solutions such as keeping doors shut, installing fly screens and sealing entry points. Sanitation – This begins by keeping surfaces clean, sealing rubbish bins, covering food, remove animal faeces, decaying plant related material and remove stale and stagnant water. When it comes to professional fly control particularly in the commercial setting, inspection is the key to sanitation. It is vital to uncover the breeding ground source to stop the spread of larvae. Professional pest controllers are trained to identify the fly species and know where to inspect and what to look for. In addition to physical exclusion and maintaining sanitation, physical and chemical control can be integrated into a fly management program. Physical control includes setting traps, sticky tapes, fly swats and electrocuting grids. Chemical control includes pesticide releasing fly strips, baits, dusting powders, sprays and misting fogs are great for killing adult flies and providing relief of the fly infestation. However, the true key in any fly management program is identifying and removing the breeding ground. Be sure to seek out and remove decaying matter, animal waste, animal carcasses, sugary substances and stale pooled liquids. By removing the breeding ground, the fly life cycle is interrupted and this approach provides long lasting results. Flies have a negative psychological impact as their presence is considered a sign of unhygienic conditions. For commercial food industries this is has a profoundly negative impact on business. 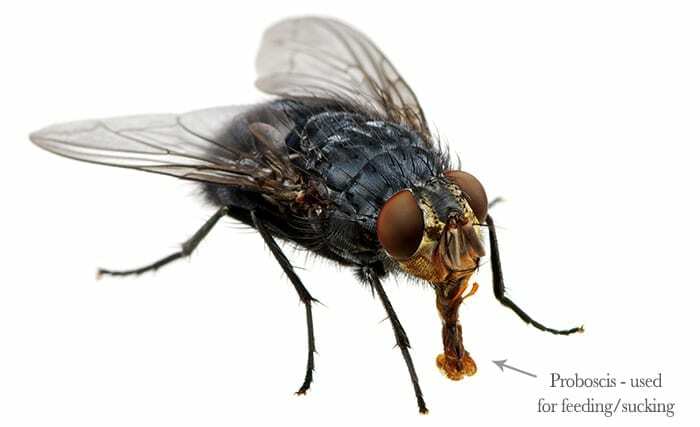 Not only are pesky flies annoying, they are vectors for harmful disease related organisms. Flies travel from filth to humans and animals. The diseases that flies can transmit include serious health threatening organisms such as Cryptosporidium, Salmonella, E-coli and Listeria. They are also known to transmit eye infections (e.g. trachoma and epidemic conjunctivitis), infections of the gut (e.g. dysentery, diarrhoea, cholera, typhoid and certain helminth infections), poliomyelitis and skin infections (e.g. mycoses, yaws, cutaneous diphtheria, leprosy). Flies also deposit unsightly faeces ever where they land. A tell tale sign of unhygienic conditions and permanent reminder when deposited on painted plaster walls. Flies fluctuate in numbers depending on the availability of a breeding grounds and the time of the year. Fly densities increase in Summer. Flies are active during the daytime and can be found near a food source and their breeding ground. The life cycle of the fly has 4 district phases – eggs, larva/maggots, pup and adult. The common house fly usually lives for 2 – 3 weeks and the female can produce up to 700 eggs over her short life time.